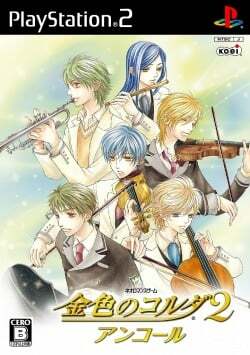 Game description: Kiniro no Corda 2 Encore is the direct sequel to Kiniro no Corda 2 and prequel to Kiniro no Corda 3. Like other Neoromance fan disc games the story is drastically shorter than its base. Seiso Academy has been saved from separation, and the protagonist has matured into a skilled musician from her experience. Three weeks after Christmas, the protagonist is called to the principal's office. She is suddenly dubbed as the conmiss, or the concertmistress and the student representative for Seiso's first public concour. Her task is to prove Seiso's worth again to the skeptic education board by forming an orchestra consisting of high school students. This page was last edited on 16 April 2019, at 10:34.